I currently hold a half-time limited term position with the University of Victoria funded through the Hakai Institute (http://hakai.org/). My academic research interests are focused on the Northwest Coast culture area of North America. I am particularly interested in the unique position of archaeology in the social sciences and humanities at providing a long-term perspective of history. My research focuses on the similarities and differences between archaeology, oral history, and paleao-environmental research and how historical reconstructions produced through these diachronic fields can be contrasted and compared to produce mosaics of the past. The research methods that I tend to employ include a combination of archaeological and palaeo-environmental techniques. Much of the archaeological research I am involved in focuses on inventory techniques and prospection using augers, coring devices, and limited excavation. The results of this type of research generally provide a regional-scale perspective. I have undertaken palaeo-environmental research that includes isolation-lake basin coring. Samples from this are then analyzed for indicators of sea level change (diatoms) and the development of vegetation communities through time (pollen). As I consider archaeology to be an historical discipline, my research methods pay special attention to dating deposits and material through absolute and relative techniques. 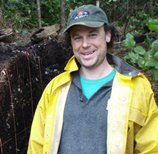 The Hakai Ancient Landscapes Archaeology Project is funded through the Hakai Beach Institute located on Calvert Island (Central Coast of British Columbia). This area is in the territories of the Heiltsuk and Wuikinuxv First Nations. The purpose of this project is to gain insights into the human inhabitation of the region over the last 15,000 calendar years. The project is designed to gather regional scale archaeological and palaeo-environmental data since the last glacial maximum. A primary goal of the project is to look for and investigate archaeological sites dating to the late Pleistocene and early Holocene epochs. This approach is being assisted by a program of study designed to provide details on the sea level history of the region through isolation lake basin coring and diatom analysis. Once post-glacial relative sea level curves have been established, archaeological survey will focus on prospecting for sites along inland relict shorelines. It is anticipated that this work will be assisted by a high precision digital elevation model derived through LiDAR or digital photogrammetry. Archaeological inventory will also seek to test inland targets that past populations would have been likely to use. In addition to the concerted effort to find early period archaeological deposits, our mandate includes recording and revisiting sites from all time periods. Archaeological site types and features that have been documented to date include: shell middens, pictographs, petroglyphs, lithic scatters, fish traps, canoe runs, clam gardens, water-logged deposits, culturally modified trees, house platforms, defensive locations, and rock shelters. Where long-term or early period archaeological deposits are suspected to occur, we have employed limited subsurface testing methods (coring and augering) to gather initial samples for dating and analysis. Where our dating results confirm the existence of long-term or early period archaeological deposits our research methods include limited subsurface testing through trowel excavated 1 x 1 m units. Ultimately the goals of this research are to gain a regional perspective on the long-term human inhabitation of the landscape. A vital aspect of this project is to highlight, where possible, aspects of continuity in the archaeological record. Where long-term continuity is reflected in resource use or tool type manufacturing, it provides insights into cultural aspects that are diachronically successful. This approach departs from goals often adopted by archaeologists which highlight and attempt to explain change in the archaeological record and who privilege patterns of change over continuity. 2016 - Gauvreau, Alisha and Duncan McLaren. Stratigraphy and Storytelling: Imbricating Indigenous Oral Narratives and Archaeology on the Northwest Coast of North America. Hunter Gatherer Research 2: 303-325. 2016 - Trant, Andrew J., Wiebe Nijland, Kira M. Hoffman, Darcy L. Mathews, Duncan McLaren, Trisalyn A. Nelson, an d Brian M. Starzomski. Intertidal resource use over millennia enhances forest productivity. Nature Communications 7: 12491. 2015 - McLaren, Duncan, Farid Rahemtulla, Gitla (Elroy White), and Daryl Fedje. Prerogatives, Sea Level, and the Strength of Persistent Places: Archaeological Evidence for Long-Term Occupation of the Central Coast of British Columbia. BC Studies 187: 155-192. 2015 真貝理香,・菅野智則,・山本直人,・羽生淳子,・松井章,・Duncan McLaren, and・Dale R. Croes. カナダトリケット島における先史時代遺跡の調査. 考古学研究 62: 15-20. 2015 - Letham, Bryn, Andrew Martindale, Duncan McLaren, Thomas Brown, Kenneth Ames, David J.W. Archer, and Susan Marsden. Holocene Settlement History of the Dundas Island Archipelago, Northern British Columbia. BC Studies 187: 51-86. 2014 - McLaren, Duncan, Daryl Fedje, Murray B. Hay, Quentin Mackie, Ian J. Walker, Dan H. Shugar, Jordan B.R. Eamer, Olav B. Lian, and Christina Neadorf. A Post-glacial Sea Level Hinge on the Central Pacific Coast of Canada. Quaternary Science Reviews 97: 148-169. 2014 - Shugar, Dan H., Ian J. Walker, Olav B. Lian, Jordan B.R. Eamer, Christina Neudorf, Duncan McLaren, Daryl Fedje. Post-glacial sea-level change along the Pacific coast of North America. Quaternary Science Reviews 97: 170-192. 2013 - Mackie, Quentin, Loren Davis, Daryl Fedje, Duncan McLaren, and Amy Gusick Locating Pleistocene-age Submerged Archaeological Sites on the Northwest Coast: Current Status of Research and Future Directions. In Paleoamerican Odyssey, edited by K.E. Graf, C.V. Ketron and M.R. Waters, Center for the Study of the First Americans, Department of Anthropology, Texas A&M University. pp. 133-147. 2011 - McLaren, Duncan, Andrew Martindale, Quentin Mackie, and Daryl Fedje. Relict Shorelines and Shell Middens of the Dundas Islands Archipelago. Canadian Journal of Archaeology 35: 86-116. 2011 - Fedje, Daryl, Quentin Mackie, Terri Lacourse, and Duncan McLaren. Younger Dryas Environments and Archaeology on the Northwest Coast of North America. Quaternary International 242: 452-462. 2011 - Mackie, Quentin, Daryl Fedje, Duncan McLaren., Nicole Smith Iain McKechnie. Early Environments and Archaeology of Coastal British Columbia. In Trekking the Shore: Changing Coastlines and the Antiquity of Coastal Settlement, edited by Nuno Bicho, Jonathan Haws, and Loren Davis, Springer Publishing Company, New York, pp 51-104. 2011 - Fedje, Daryl, Quentin Mackie, Nicole Smith, and Duncan McLaren. Function, Visibility, Interpretation of Archaeological Assemblages at the Pleistocene-Holocene Transition in Haida Gwaii. In From the Yenisei to the Yukon: Interpreting Lithic Assemblage Variability in Late Pleistocene/Early Holocene Beringia, edited by Ted Goebel and Ian Buvit, Texas A&M University Press, pp 323-342. 2009 - Andrew Martindale, Bryn Letham, Duncan McLaren, David Archer, Meghan Burchell, Bernd R. Schöne. Mapping of subsurface shell midden components through percussion coring: examples from the Dundas Islands. Journal of Archaeological Science 36: 1565-1575. 2007 - Bornhold, Brian D., John R. Harper, Duncan McLaren, and Richard E. Thomson. Destruction of the First Nations Village of Kwalate by a Rock Avalanche-generated Tsunami. Atmosphere-Ocean 45: 123-128.